Circle is a ring of people, in which you can instinctively encounter the other. We all have an experience of getting into a fight, being fed and of seduction and mating. These experiences lie deep within us and raise the feelings of curiosity and excitement, relief and pleasure. The participants form a circle around a shared stage area. Any two people from the circle may move into the center to encounter each other while the others witness their encounter from the perimeter. The encounters play with three areas of instinctive behaviour: nurture, power struggle and sexuality. 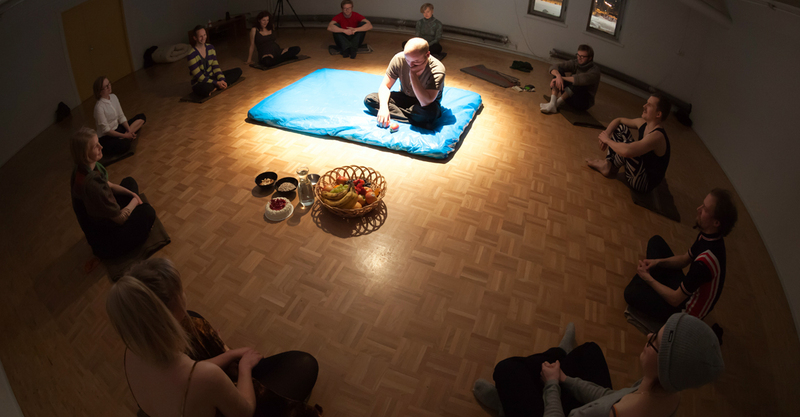 During 2013 Circle was organized once a month and Morning Encounter Classes weekly. Each month we studied one archetype of encountering: either fighting, feeding or mating. In Circle the archetypes are practiced in the form of a ring of people. In the Morning Encounters the subject of the month was explored through different exercises. In addition, we visited a sociological conference in Turku, an anthropologist conference in Tampere, the Outlaw theatre festival in Pori and the Festival of Artistic Research in Helsinki. During 2014-15 Circle has been performed occasionally. Circle was developed as a part of Utopian Reality, which was Reality Research Center’s research project of 2012-13. Utopian Reality strove to create utopian practices and forms that could enter the society and the everyday life of it’s participants. CIRCLE IS AVAILABLE ON DEMAND BOTH AS PERFORMANCES AND WORKSHOPS.